If you are looking for a breakfast burrito recipe, you have come the right way. A wrapped burrito is very delicious and portable answer to breakfast. I am sure you will be delighted to have such a tasty and delicious breakfast to have with tea. Most important meal of the day is breakfast. People skip breakfast to lose weight or to maintain their body, without knowing that skipping breakfast can make their weight stuck and even gain more weight. Because people who don’t eat breakfast tend to eat more throughout the day because they started their day empty stomach. So it is important to have breakfast first every morning and ask your kids to make it habit. 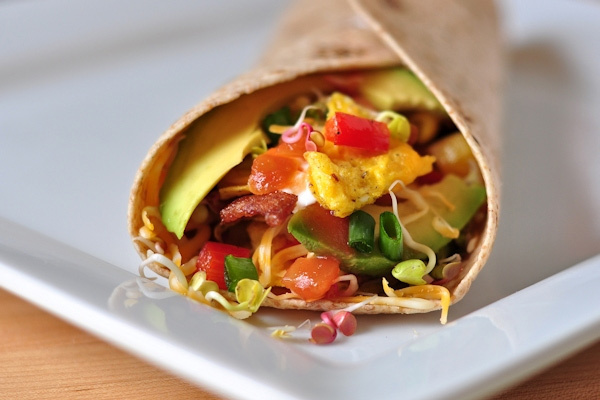 So here we have a very delicious breakfast burrito recipe to cook at home. Break eggs in a bowl, add 2 tsp. of water, salt and black pepper in eggs, and mix well. Heat the non-stick pan with 2 spoon on oil or butter and fry eggs until light brown or fully cooked. Mix cumin seeds, grounded garlic and paprika powder in sour cream and mix well. Mix whole grain and all-purpose flour with a spoon full of butter and a pinch of salt, and add water to make hard dough. Place this dough in fridge for an hour. Now make pancakes with dough and fry in non-stick pan. Place a spoon full of eggs, chopped tomatoes and sour cream mixture on pancakes and fold in triangles. Serve with little more cream and garlic mayo.